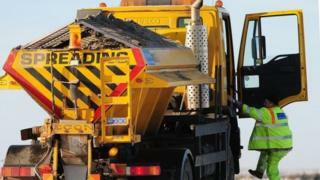 Image caption Bradford Council currently has 34 gritting vehicles on standby from October to April. The cold spell earlier this year, nicknamed the "Beast from the East", led to Bradford Council overspending on winter gritting by more than half. February and March's snow meant the authority exceeded its annual winter service budget of £840,700. The final amount spent was £1,360,858 according to a council report on how it is preparing for the coming winter. Bradford's gritting was "the highest level of precautionary treatment in West Yorkshire", the report said. The 19,000 tonnes of salt spread on the roads was almost three times the previous winter's 6,900 tonnes with gritting teams on the roads for 22 weeks out of 27 from October to Easter, the council said. The weather had "placed extreme stress" on the service "in the light of reduced resources", said the report. The effects of climate change were likely to result in increased frequency and intensity of severe weather events, it added. The council is planning to use trained drivers from other departments as well as the existing gritting team in case of another severe winter in 2018-19, said the Local Democracy Reporting Service. Bradford Council currently has 34 gritting vehicles on standby from October to April. A normal gritting run includes 24 routes covering more than 710 miles, it said. The priority gritting roads include bus routes, roads with the highest amount of traffic and access to hospitals and schools, according to the council's website.